Please join the PTA for the final meeting of the school year on Tuesday, May 30, from 6 to 8 pm in the school cafetorium. Ms. Kosmala will be updating us on the funding situation for the 2017/18 school year and how it will impact staffing. Childcare will be provided and pizza will be served from 6 – 6:30 pm before the meeting begins. 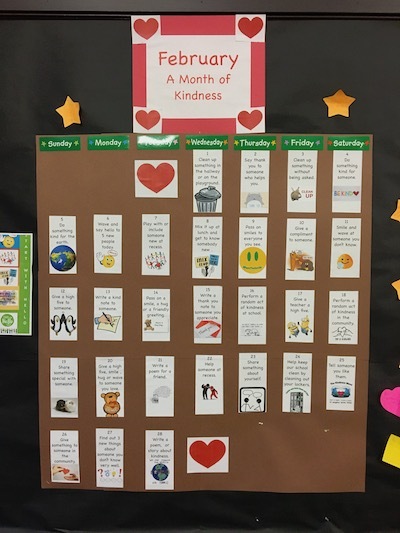 This February, Buckman is participating in a school-wide initiative focusing on kindness. 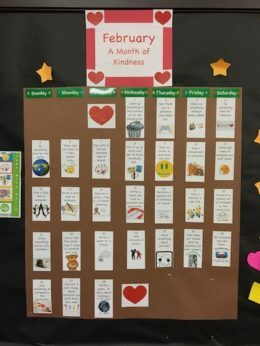 Througho ut the month, students at all grade levels will be encouraged to focus on kindness in every day challenges, specific programs, and dedicated projects. The Month of Kindness kicked off with the Sandy Hook Promise program “Start with Hello,” aimed at encouraging students to reach out to those who may be experiencing social isolation. You may have also noticed the compliment board and kindness calendar located in the front lobby of the school. Stop by and see what students are up to, as well as the kind words they have to share with one another. If you have small to medium size river rocks or want to donate paint pens or spray paint please sign up here: http://signup.com/go/ZHj2o4 and bring them to Wendy Crozier in room 101 by Thursday, February 23rd. Please check out the murals on the upper playground created by Buckman neighbor, Clutch. He volunteers his time to beautify the school. More public art to come. PTA, in conjunction with Mr. Simmons, will be working to repaint the upper playground lines and map. Thank you to Ms. Rudnick for all of her hard work in the library to expand programming. Season of Sharing will take place in December. If you or any Buckman families you know have a need for gifts around the holiday times, please contact Diane to find out more about the program and/or to apply. November 15th, with the help of Wendy Crozier, Literacy Night is happening at the school. Theme is Carnival of Words. Contact Wendy Crozier to get involved. Meeting minutes were reviewed. Angela Kirkman made a motion to approve the minutes. Cheryl Lapsley seconded the motion. Minutes approved unanimously. Standing Rules for the 2016/2017 school year will remain the same as last year. We reviewed these rules. Krista Hofmeister made a motion to approve the Standing Rules. Cara Althoff seconded the motion. Standing Rules approved unanimously. Hillary reviewed the budget for the 2016/2017 school year highlighting a few of the larger expenditures to explain what they were for. Hillary proposed the necessary action of adding a line item to the budget to pay for an expenditure (6 ipads for the school) that was approved during last school year’s budget cycle. The actual purchase of the ipads did not take place before last budget year ended. And so the proposal was made to add a line item to this years budget to cover this cost – to be called “Reimbursement of Approved Funds from 2015/2016”. Angela Kirkham made a motion to approve the line item. Krista Hofmeister seconded. Approved unanimously. Two representatives presented their argument in favor of Measure 97 which would close the corporate tax loophole and provide a much needed influx of cash to education and some social services. Water – water dispensers are being used successfully throughout the school. No more single use bottles. Keep sending your kid to school with their own water bottle. Buckman Pool – Susan explained the status of the pool due to peeling lead paint, asbestos and the need to relocate the HVAC systems to a different part of the building. Estimates for this repair work is around $350-450K. Friends Of Buckman Pool are pursuing grant money to fund this expense and while they are searching for $$, the pool remains filled with water to keep it limping along. It is unclear at this time if the Friends Of Buckman Pool will be able to come up with the necessary funds. Enrollment is at 465 and the school is comprised of 50% neighborhood and 50% transfer. Susan reviewed Smarter Balanced Test results from the previous year. Inconclusive due to students opting out and the fact that the test has still not been proven valid. Students now have two recesses instead of one. PBIS – this is the new behavioral program currently in place. Enrollment numbers should stay stable to growing in the coming years. There is some room to add lottery slots for the older grades but there is no priority placed on trying to get enrollment above 500 because although it would result in more FTE’s for the school, it would also mean class sizes that are too big. In order for Buckman to pay for all FTEs next year, Measure 97 must pass. The upcoming school budget was based on 97 passing and if it doesn’t, there’s potential for the school to be in a funding crisis. Oye. PE requirements are shifting. 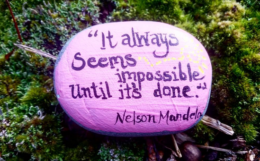 10 years ago there was legislation passed that said all PPS schools must provide 150 minutes of ‘intentionally and sequentially taught movement’. The state gave the schools 10 years to get to this point. Buckman has used time spent doing run/walk, dance, music class and classroom teacher led activities to meet these requirements. It is unclear whether the district will continue to accept the Buckman way of PE or if they will demand Susan hire a dedicated PE teacher. This is another expense that would make it problematic to pay for our arts teachers in the coming years. Is anyone still reading this…..? October 30 – Bowl-o-ween at Grand Central Bowl from 11am – 1 pm. Wear your costumes! Back-to-School Info, Welcome New Buckman Families! We are partway through July… which means the school supplies are on the shelves and back-to-school excitement is already brewing! School starts August 29 for 1-5th graders and September 1 for kindergartners. With that in mind, we thought it would be good to put out a few reminders about upcoming events and provide some information for new Buckman families. School events are now being posted to the buckmanelementary.org calendar. An agenda view of upcoming events is visible on the home page of this website, or you can bookmark and access the calendar on the events page for a monthly calendar display. We encourage you to use the calendar add/subscribe link to feed events directly to your personal calendar (Google, etc) and on your mobile devices. If you run into any trouble subscribing, contact admin@buckmanelementary.org for assistance. If you haven’t already checked out the parent-run Facebook page, you can visit it here for regular postings of Buckman happenings. The Buckman PPS website also publishes regular information at both a district-wide and school-specific level, including the weekly Buckman newsletter. Once school begins, you will also receive the newsletter in your inbox. There are lots of ways to get involved in the Buckman community. This website details some of the parent-run organizations that provide volunteer opportunities. Read up on the Buckman PTA and the Buckman Foundation for information on what each organization does; our fundraising page details how the two organizations differ. You can also check out specifics regarding Buckman’s biggest school events: the Buckman Art Show and Sell (usually takes place in March) and the Buckman Auction (often occurs in April). If you have questions about how you can get involved with either school organization, don’t hesitate to send an email to pta@buckmanelementary.org or foundation@buckmanelementary.org. Buckman loves volunteers! If you haven’t already purchased school supplies, you should have received a supply list with your child(ren)’s teacher assignment. An easy option for many people is to order through Schoolhouse Supplies. The Buckman list has recently been posted; you can head to the online ordering page and select Buckman Elementary. Take note of the school code to be sure you get the right supply lists. We hope some of this information has been helpful as we look forward to the 2016-2017 school year. Stay tuned for further updates as we get closer to the start of school!